The common denominator between these two sketches is not the cloaked anatomy of the backs, it is gesture. The figure on the right is centered and stable. The left figure is out of balance: the chair is tilted; the man is twisted, as if he is in motion. The differences can be attributed to the technique used in each sketch. 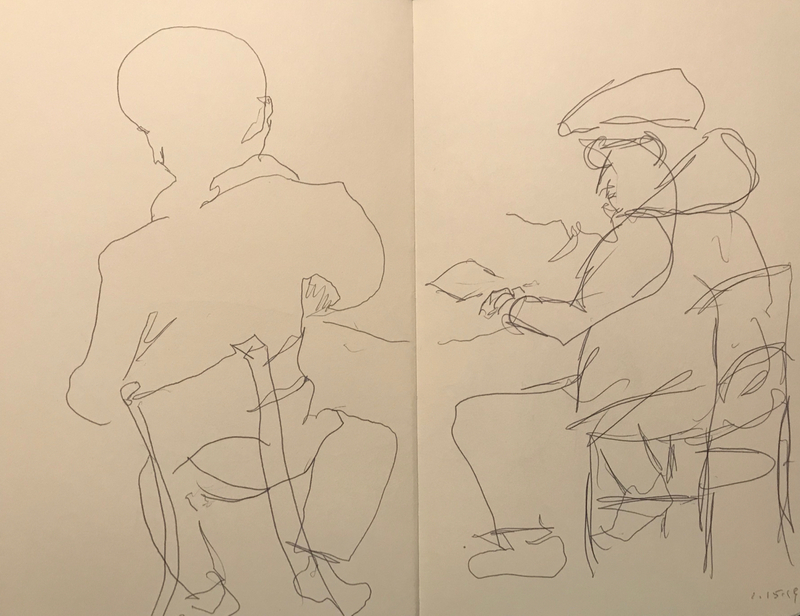 The stable figure was drawn in a traditional way – alternating between looking at the paper and the subject; the second was drawn ‘blind’ – only looking at the subject and not the paper. The former method allows the artist to compensate for errant lines, thereby ‘correcting’ the drawing. The latter method eliminates the feedback between eye and pen and, in my opinion, allows the unconscious a role in creation. This entry was posted in Personal Stories and tagged artistic expression, blind drawing, creativity, drawing, gesture, pen and ink, sketch, unconscious, unconscious creativity, visual art. Bookmark the permalink.